We have carefully selected shooting drills for Concealed Handgun License (CHL) holders to respond effectively in real world situations. These courses address active shooter and terrorist threats in public places such as shopping malls, family tactics, different strategies when encountering lethal threats in public, personal security detail techniques and strategies similar to those used by elite government agents working in high threat environments from around the world. With our Active Threat courses, you will be drawing from a concealed holster. 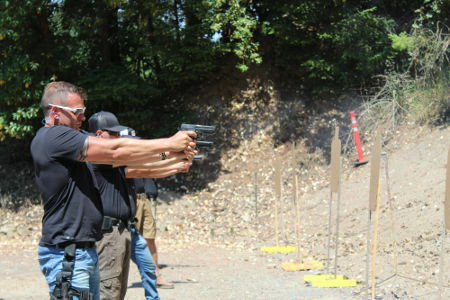 Red Frog tactical pistol courses teach a transition of skill sets that transfer from the range throughout a myriad of different applications and environments such as, Close Quarter Battles, Close Quarter Combat, Military Operation in Urban Terrain, Land Warfare, and Combatives. Preferred holster location, hip. Drop leg holsters not recommended. Use of an overt holster with or without retention is required. With our Pistol Courses you will need to be using a holster attached via Battle Belt, Duty Belt, or paddle.